OPINION | Crises in Command? Home / India / Indian Air Force / Indian Army / Indian Navy / Kindle / Military / Opinion / South Asia / OPINION | Crises in Command? 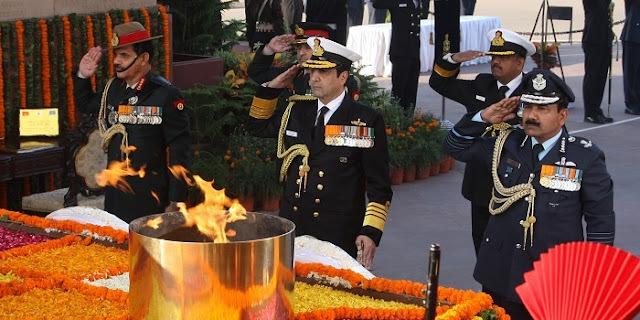 Opinion is rife in the Indian media about military leadership and associated concerns. The latest issue relates to supersession by the new Army Chief, whilst another pertains to the much maligned previous Air Chief and how he rose to be Air Chief at all. Military leadership has traditionally got short shrift in our country, unfortunately, for various reasons. One reason could be the supposed lack of strategic culture in our nation, leading to a total lack of understanding of matters military by the civilian hierarchy and hence the OROP/Pay Commission fiascos too. Another reason could possibly be the gradual “corporatisation” of the Indian armed forces, more so in recent times, compromising time- proven military leadership skills with flamboyant corporate mismanagement. The Americans, who have traditionally articulated more on the nuances of military leadership , indeed even more than the British or any other leading military, came out with a classic treatise titled “Crisis in Command” (and hence the title of this piece!) written so eloquently by two U.S. Army veterans, Richard A Gabriel and Paul L Savage. Back in 1979, these authors postulated on how the U.S. Army had lost its combat edge thanks to what they believed was the corporate culture creeping into its military ethos during the Vietnam era. It is time for India and its defense establishment to revisit its own military leadership culture and identify weaknesses if any in nourishing it. Much more copious media debate and agitation by the cognoscenti are required before policy changes could possibly be brought about in this regard. Military leadership offers altogether different sets of challenges than its civilian variant. Over the years civilians who tended to imbibe or ape certain aspects of military leadership traits generally caused detriment to the people who were to be led, uncomfortable as the civvy street is too autocratic styles. The contrary situation, of any military attempting to “civilianise” or “corporatizing” its leadership ethos, could be much more dangerous, as national security directly gets compromised.A military leader essentially needs to lead men into battle (with some variation in the case of the Air Force where only a select few aircrew enjoin battle as such). However, when there are no real battles to be fought, unfortunately as obtains these days in our context, the armed forces tend to lose their leadership perspective and consequently their fighting edge.The Indian armed forces are surely not designed only for counter-insurgency or Low-Intensity Conflict Operations (LICO). The challenges are even more profound when a military establishment has to keep its combat head on its shoulders in times of comparative “peace” or “no peace no war” situations. This is when basic tenets of military leadership just cannot be allowed to be glossed over. The biggest bugbear for a peace-time army (or Air Force or Navy for that matter) is what the American authors of the work mentioned above call the “ticket-punching” phenomenon. Every military service lays down norms for its officer cadre to transit effectively from its tactical to operational and strategic levels of leadership. Nevertheless, some officers, unfortunately, choose to ticket–punch their way through the laid down hierarchical shaft, either avoiding some of the most challenging assignments altogether through side steps to “low threat “assignments or by opting for other ornamental staff jobs. To add insult to injury, such cozy jobs, such as those of staff officers or certain easy-going deputations etc also tend to offer inflated report statuses numerically, the concerned ticket – punchers thus stealing a march over their well-intentioned colleagues who expose themselves to operationally much more challenging and riskier assignments. The situation is similar in the Air Force and the Navy, varying in the peculiarities of the Air Force or the Maritime operational domains. The promotional criteria in all services, therefore, ought to be based on the successful transition of a military leader across the mandatory field and staff assignments across the levels of war - tactical, operational and strategic - and not any other extraneous considerations. Another factor which assists ticket-punchers in getting inordinate due is the ill- thought out changes in personnel policies, at times provoked by the MOD. The Staff/ Operations criteria attempt proposed by the Army (and undone by the MOD unceremoniously for some reason!) and the wanton reduction some years ago of "discretionary weightage" drastically from 25% to 5% (precluding the scope for compensating a deserving candidate objectively during promotion boards for higher ranks in the Air Force) are two such cases in point. The long and short of the foregoing is that only an “operationally sound” officer ought to rise through the ranks to become the Chief of the Army, Navy or the Air Force. If this message is sent across clearly by the establishment, most of the travails regarding inept senior level military leadership would be overcome. Of course, it is possible that even with such a merit-imbued promotional criteria in place, a senior military functionary or even a Chief himself could get compromised in some arms deal or the like. ACM Shashi Tyagi’s is one one such case, wherein someone who is highly accomplished and who has “gone through the mill” is now alleged to have indulged in self-promoting indiscretion. But then this kind of situations need to be addressed through reforms such as IB vetting, subordinate reportage in Confidential Reports and increased transparency in the equipment procurement processes. What is currently playing out with the retired Air Chief is a different matter altogether. He appears to be the fall guy for other "Bigger fish" or political entities who are apparently being shielded perhaps. With a proactive judiciary such as ours, the truth would finally prevail, finally, prevail. But, it is also indeed a hard fact of life that a lifetime of righteousness gets undone by one minor indiscretion. The requirement, therefore, is to ensure that military leadership does not get compromised in terms of dilution of mandatory qualitative criteria for any promotion, more so the ones to starred ranks.No one needs to lose sleep therefore if a person with better operational credentials supersedes lesser endowed peers. Military leadership has to be nurtured over time. Since performance in wars may not always be a practical criterion, more so now when the entire military leadership is from a "post-era" commissioned as they are post 1971, the system looks for other norms such as performance in exercises, in-service courses or inspection reports by dedicated agencies. But the sad part is that, at times, even these get flouted, leading to the wrong man being elevated to the top job. Mr. Parikkar is quite right when he says that seniority alone cannot be a criterion for promotion. This is where we need doctrinal precepts to support our personnel policies, preventing tinkering of norms without objective analyses. It is not necessary to only learn from the mistakes of other advanced militaries always... we do not even have in place any institutional Quadrennial Defense Reviews (like those in the U.S. DOD) to undertake reformations in our military’s operational, administrative and support infrastructure and procedures. Group Captain (Retd.) Murli Menon served in Indian Air Force for 32 years, transiting it tactical, operational, strategic and conceptual appointment spectra with credit. He was India’s Air Advisor to Indian High Commission at Islamabad, Pakistan (2000-2004). In his second avatar, he served for 8 years with India’s Cabinet Secretariat, including a stint as Consular at Ankara, Turkey from 2008-2011. He was one of the pioneers in the IAF’s Doctrine Think Tank – “Air War Strategy Cell” that produced India’s first Air Power Doctrine, the IAP 2000 in 1995. His interests include strategic studies and since post-retirement, he contributes to various think-tanks based out of New Delhi, India. Disclaimer: The views and opinions expressed in this article are those of the author and do not necessarily reflect the views of IndraStra Global.